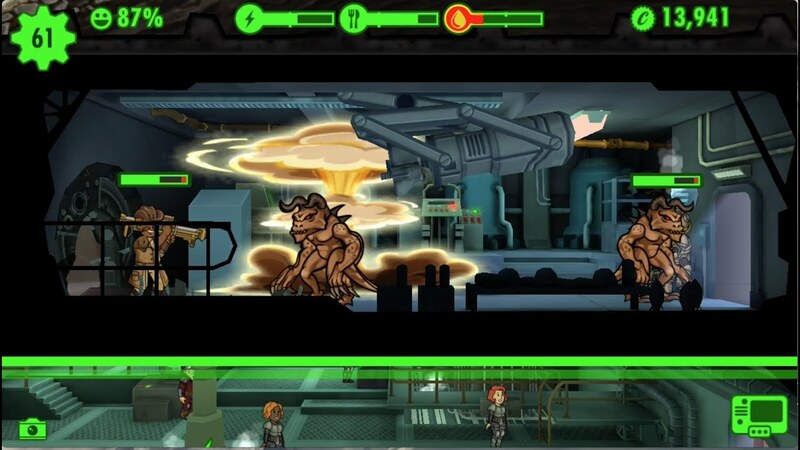 January 21, 2017 January 21, 2017 Laura M.
The mobile game Fallout Shelter is now free on PC as well, and being the fan of the series that I am, I decided to give it a try. Now, as a disclaimer: I love the series, but I’m not a diehard fan, which means I don’t know each and every detail about it, and thus I won’t be commenting or comparing anything story wise (not that there is much story) nor between games. The game is pretty basic rooms/survival when it comes to mobile and strategy/building games. You are the Overseer for a vault number of your choice, and your job is to ensure the vault runs smoothly and he survivors that arrive thrive, and expand the shelter for more of them. For this, you need to make sure they have three basic resources: power, food, and water. You have various rooms you can build, each bumping up different things. Each room requires a particular SPECIAL skill, and the better you place your dwellers (the one with the highest SPECIAL in the matching room for it), the better the room will perform. Rooms can also be ‘rushed’ for the resources, but there is a chance you might fail, and failure means one of the random failure scenarios will occur: fire, rad roaches, raider attacks, etc… these also may happen at random during gameplay. The more you expand and the higher level your dwellers are, the more chances of such things happening. You have pets, weapons, clothes that you can equip everyone with, and items you can take apart for parts to craft weapons. 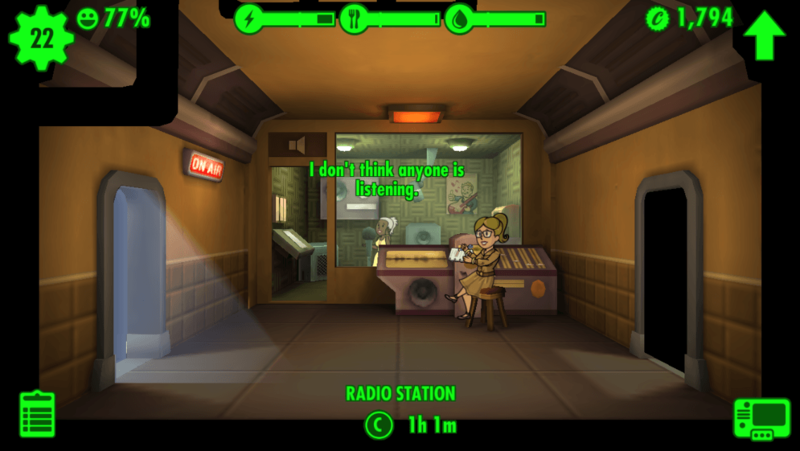 There are caps, of course, earned by rushing rooms successfully, completing quests or game goals/objectives, exploring, and leveling dwellers. You can upgrade rooms to better their performance time. All in all, for a casual game, it has quite a bit of attention to extras and depth, but like most casual games –even the ones that do have some- it’s lacking in story. 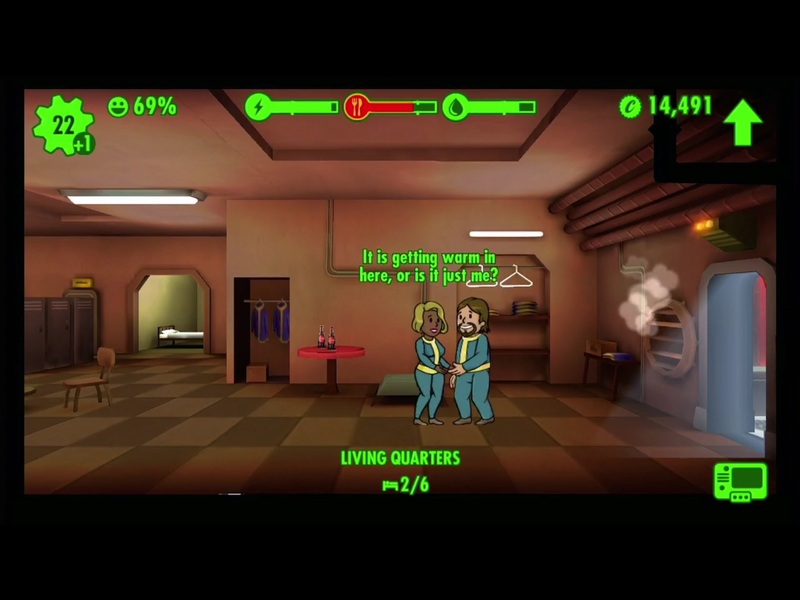 I do think fallout Shelter will please people who are into a bit of strategy, as room placement and dweller placement is very important. Even putting a man and woman in the same room does not always guarantee they will get along enough to procreate. They do have little speech bubbles when you zoom in which are cute and funny, but also heavily repetitive. They do, however, let you know the status of how your expected couple is going – if things are going well or not. The animations were cute, the characters were as expected, the rooms were surprisingly 2.5D, and the detail of what you saw changing when you move the map around was extra sweet. Sounds, music, effects, it was all awesome as expected. Being a port, I found clicking and dragging dwellers to be a bit hit and miss. Often after quickly switching between dwellers in a room one would get stuck and I would be unable to pick them back up without reloading the save. On that same note, sometimes I would try to drag the map and end up accidentally picking someone up, as both left and right click serve to do the same things, apparently. This made it particularly annoying if I didn’t notice in time and accidentally ended up switching someone… more so if that someone happened to get stuck right after. The wait time to get things done, when playing on PC, is annoying. I’m not going to be opening and closing a game every three hours because I have absolutely nothing else to do while waiting for children to grow up or a birth to happen in order to keep playing. I’m also not going to leave it open in the background- particularly as, for a casual game, Fallout Shelter slowed down my pc as it had so many animations going at once, and on top of that, required none other than Bethesda’s own launcher to be installed and running at the same time. This is particularly annoying as even if I were to leave the game and come back, I still feel like I’ve not advanced any and I mainly just come back to re-assign people and then leave it again. It’s not something I find overly encouraging to keep coming back to. And the worst of it all, which made me bump down one whole star, and which I’ve already briefly mentioned and is amusingly enough not related to it being a port: they force you to install and use their own launcher. Why. Just WHY? How many launchers should a person have installed because you all want to be “unique”? You don’t attract people to your platform by forcing them to install launchers. You attract them by making GREAT games. That said, it is a great game with a lot of depth for a casual build and survive game, and whether you’re a fan of the franchise or not you are sure to like it, but it’s still not something I think I will be coming back to too often. A good game hampered by some questionable design choices. Still, for a FREE game, I can’t complain much. October 11, 2015 January 19, 2017 Laura M.
Castaway Paradise is sold as an RPG, but really, the only RPG element I see in it is the questing. I would compare it more closely with a social game or even a mobile game than any actual RPG. There’s no enemies, and no story beyond “You’ve washed up on the shore of this island and now you can help the people rebuild and make it your own home”. The menu is lacking in the same way mobile and social games are, there’s no sliders for volume, just mute or unmute things, no windowed mode options, though alt+enter provides you a window the exact same size your resolution. Starting the game, the music was decent, but repetitive. What sound effects there are are also rather typical of the kind of game. I also wasn’t completely sold on the graphical aspect of the characters, which is an undecidedly blocky 3D version of animals/humans, but I did like the aspect of the island/items/everything that wasn’t characters and clothes. The clothes designs were cute, but I still didn’t like the characters shape, which really ruined the looks of the otherwise cute designs. 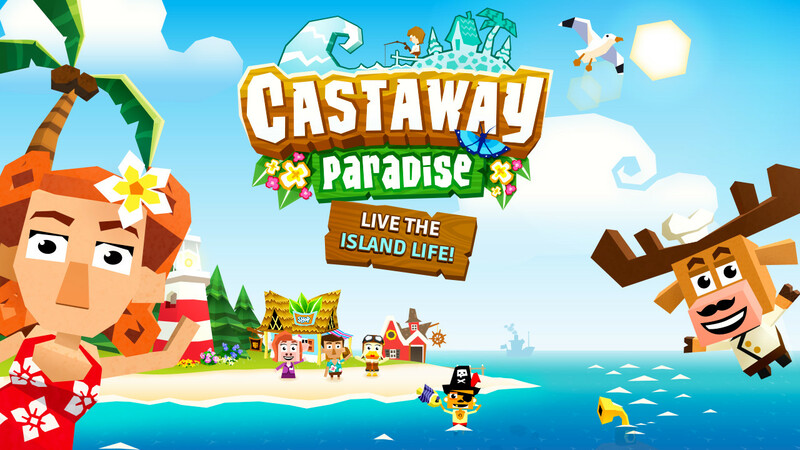 On Castaway Paradise you can take quests from the villagers, farm crops, catch fish and bugs, shake trees, plant trees and flowers, cut trees, pick up weeds and trash to clean up the place, dust off cobwebs, upgrade buildings a couple times and decorate the island and your home, and then some I probably forget. There’s also a bank that will allow you to earn some extra money for using it, as well as a mini stocks market that’s not really too difficult to use at all. You can also unlock new spots to visit on the island, which isn’t overly large to begin with. It’s all rather nice, and I appreciate that it has something more to do than just plant crops or just do quests, but it doesn’t feel terribly fulfilling until you start decorating the island and your house. The crops and things you plant have a timer on them, as with all social games, which means you can’t play when ‘you’ want but have to wait around until the game decides the crops are ready. Some of the tools have a ‘stamina’ meter, a certain amount of times you can use it per x time, that refills overtime. This goes away when you reach level 15 and become “VIP”, which was their way of removing the need for micro transactions. This also unlocks more shop items, cheaper items (“discount”) in the shop, etc. Starting by the fact that the quests are all the same: plant x of this, pick y of that, take this to z, talk to w; rinse and repeat as there’s only so many characters. The rewards they give (xp, sometimes items and pieces to unlock new areas of the island, and gems/money) are not really worth the time. 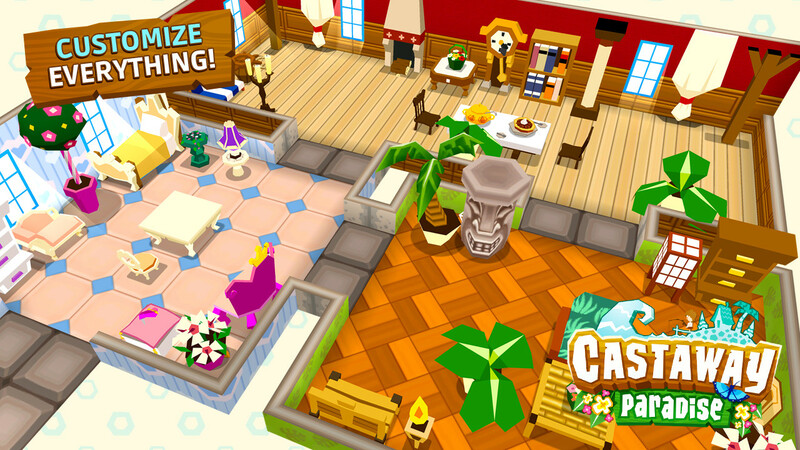 The money you make from them sometimes ends up being more than what you need for the quest – for instance: Decorate the island, where you have to place two chairs that are worth three times as much as the reward. Granted, you can pick up and resell if you only want to finish the quest, but you only get part of the money back. The quests can also not be cancelled, at least not that I’ve seen, thus you’re stuck with either gathering enough money to buy the things they want you to get so you can finish the quest (or waiting however many hours for crops when you want to play NOW), or gathering enough money to pay off to “fast finish” the quest, which is also kind of expensive. Since you can’t really preview and accept or reject the quests, and since you can only have 3 going at a time, it gets really boring. Planting and selling crops also doesn’t shield much money when you take into account some of the crops take 11+ real time hours to be ready… on stage 1. Some have more than 1 stage, though you can choose to pick them while they’re smaller rather than let them grow to its fullest. Meanwhile, upgrading the buildings and purchasing things is quite pricey in comparison. It’s not impossible, but it’s kind of annoying. In the long term, it almost seems more worth it to stand by the stocks and wait for them than wait for crops and do quests, and neither turns out being overly fun after the first few rounds. Even catching bugs or fishing, which are the most interesting aspect, get tiresome. There is a little annoying ‘bug’ that if I try for my character to go somewhere else while it’s running an animation, it will get “stuck” in that direction and when it stops doing the animation it will walk the way he was looking instead of the way I’m telling it to, but it’s hardly game breaking. I do, however, wish you could stack things to do (so do this, then water crops, then come over here kind of thing). On the upside, the game has some free DLCs that add a bit of (shop) content, and they also run events. They have leaderboards for the collectables/bugs/fish you catch, and it is kind of a cute game, all things considered, but it is the kind of game you go onto for an hour or two and then get tired with. Recommended: Yes if you like social games and don’t mind it being terribly repetitive after the first few quests (which I guess you don’t, if you like social games ).